Manor Crag continues to bear fruit, at least for those good enough to pick it. 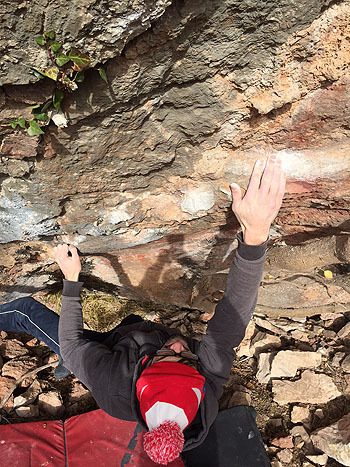 This week Danny Cattell climbed the fierce crimpy line just right of Jawa. Dabber the Hut 7C starts sitting with hands on a crimpy rail; a hard slap gains a sloper up right and then the crack on the right side of the shield can be engaged with. The line finishes out left into the top jugs of Jawa. The name is a reference to the fact that you can’t avoid slightly touching the adjacent clinger tree, although it doesn’t help. The day before Pete Robins popped over and grabbed the obvious leftwards lip extension to Tusken Raiders. Storm Trooper rates 7B+ and Pete has suggested that with the correct use of heels Tusken Raiders is worth 7B. Grade confirmations came the following day from Danny Cattell and Jordan Buys who both made a quick repeat. Now that some of the new and existing lines are getting some attention a few grade adjustments are emerging. It seems that The Lengthy Scholar is definitely 7B+, such is the fierce nature of its crux. Pete has suggested that Manor Mouse is probably 7B+ for tall climbers but may be 7C+ for those lacking the reach (NB. he hasn't done the problem yet). A few of the 7Aish problems may need adjustment too – please get in touch with any comments as it will be good to build a proper consensus for the new guide. 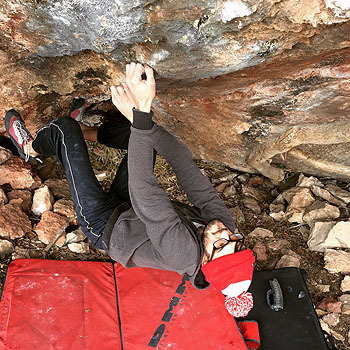 Check out Chris Doyle’s latest Manor Crag film which includes footage of both first ascents.